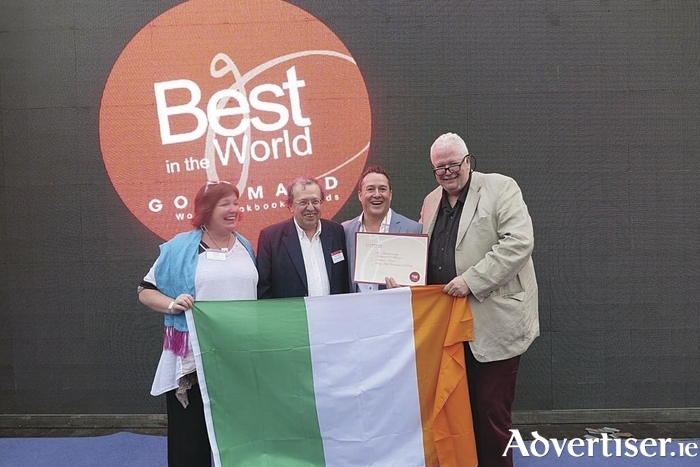 Sea Gastronomy: Fish and Shellfish of the North Atlantic was awarded the top prize at the Gourmand World Cookery Book Awards in Yantai, China, on Sunday May 29. This ceremony is often referred to as the ‘Oscars’ of the food industry, and represents the most illustrious award available to culinary writers worldwide. Published by Artisan House, Connemara, Sea Gastronomy is only the fourth book which has been procured by the small printing house which oversees every step of the publication process. Directors Mary Ruddy and Vincent Murphy were delighted with the prize having opened the doors of Artisan House, just three years ago, in 2013. “For a young publisher to compete on a world stage is a great honour, and to come first is almost unbelievable,” said Ms Ruddy. Written by Michael O’Meara, head chef at Oscar’s Seafood Bistro, Dominick Street, the cookbook is a testament to his passion for all that the sea has to offer. “We believe in the quality of Sea Gastronomy, Michael O’Meara is not only knowledgeable but passionate about fish and cooking,” said Mr Murphy. With more than 380 sea life photographs, some 220 seafood recipes, and detailed information on hundreds of seafood species in the north Atlantic, the book is a comprehensive guide to the waters which surround Ireland.